2003-AUG-14: Judge Moore refuses to remove the monument: Judge Moore stated at a news conference that he has: "...no intention of removing the monument. This I cannot and will not do." He criticized U.S. District Judge Myron Thompson for his "callous disregard for the people of Alabama" and their tax dollars. He told reporters: "We have a federal judge saying we can't recognize who God is, yet that's the basis of our justice system. They have the audacity to come into our court and say we have to remove the foundation of our law, which is the Ten Commandments." Ellen Johnson, President of American Atheists said: "Justice Moore should resign immediately. He is doing everything he can to resist a federal court order to remove an unconstitutional, sectarian monument of the Ten Commandments from the entrance to the state's Judicial Building, and clearly is using his authority to promote religion....Look at the message Justice Moore is sending to the public, especially our young people -- if you don't like a particular ruling, especially one that stops unconstitutional religious proselytizing, just defy the courts." 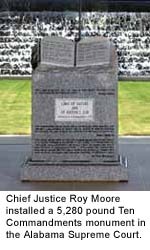 2003-AUG-15: Appeal sent to the U.S. Supreme Court: Judge Moore's lawyers have refused to acknowledge the authority of the federal judge who ordered the monument to be removed. One of his attorneys, Herbert Titus of Virginia Beach, VA, told the Supreme Court that the federal judge's decision "has threatened to invade the Alabama treasury for billions of dollars in an effort to cower its officials into prompt compliance with the court's final judgment and injunction, as well as to provide a significant incentive for state officials to initiate proceedings to remove Chief Justice Moore from office." The mention to "billions of dollars" apparently refers to the threat by U.S. District Judge Myron Thompson that fines of about $5,000 a day could be imposed against the state if the monument were not removed by 2003-AUG-20. Titus also wrote that the ruling also "abridges the right of the people, through their elected representative the Chief Justice, to acknowledge God as indispensable to the administration of justice." 2003-AUG-16: Rally to retain the monument: Various groups descended upon Montgomery, AL to support Judge Moore and his decision to not remove the Ten Commandments monument from the Alabama Judicial Building. Co-organizer of the rally, Rev. Scarborough from Vision America predicted that 25,000 would attend. Most media estimated that about 3,500 actually did show up. Moore told the crowd: "It's not about me. I will pass away...but the laws of God will remain forever... It's not about politics. It's not about religion... Let's get it straight. It's about one thing. It's about the acknowledgement of the God upon which this nation and her laws are founded....If this ruling is allowed to stand, it will reverberate from state to state to state to the nation's Capitol and the acknowledgement of God will be taken from us. If we sit quietly by while this inalienable right is taken even the rocks and the trees and the stones that you see will cry out....If I should fail to do my duty in this case, for fear of giving offense, I would consider myself guilty of treason toward my country and of an act of disloyalty toward the majesty of heaven which I revere above all earthly kings....We are fighting a battle. You're a soldier , if you don't know it...It's spiritual warfare." He read an excerpt from one of his poems about the country's Founding Fathers: "These men would never question the sovereignty of God...I'm glad they're not here with us to see the mess we're in...Darkness is now called light." Rick Scarborough of Vision America described Judge Moore as a "modern day Daniel being destroyed by the juggernaut of evil...The nation is like it is because the church has fallen asleep." He said that the conflict over the monument is a "decisive battle in a 40-year culture war against our faith...a militant minority is stripping vestiges of our faith from the public square." He also said: "This is not the end of this movement. It's the birth of this movement....We're here because we believe our God has been insulted." take a stand and finally put a bridle on these unruly courts." a spiritual renaissance and we need it now." Referring to Moore, Falwell added, "When God gives you a champion, get behind him." Political consultant Rick Shaftan had traveled from New Jersey to attend the rally. He said: "This thing today was one of the most important political gatherings in the last 15 or 20 years. In my part of the country, people laugh at this issue, but these are the very basic American values....There's a real resentment against unelected officials making laws and people are getting fed up with it." Howard Phillips, a 1996 presidential candidate and chairman of the Conservative Caucus, suggested that the President appoint Moore to the next vacancy on the U.S. Supreme Court, and that Federal Judge Myron Thompson should immediately resign. He said: "Judge Thompson has violated his oath of office by disregarding the constitution and attempting to usurp and elected judge of the state of Alabama. That's why we hold them (sic) in contempt...."They are the Benedict Arnolds of American jurisprudence and should be stripped of their robes." A tiny contingent of about three dozen supporters of the separation of church and state also showed up at the rally. Greg McDowell, Florida State Director for American Atheists asked: "How would he like it if people disobeyed his orders? When it comes to this country's laws no man's ego and nobody's religion should come above the constitution." One Atheist carried a sign referring to the Judicial building as "a courthouse, not a church." 2003-AUG-18: Stay of judicial order requested: Attorneys working for Justice Moore applied to the 11th U.S. Circuit Court of Appeals, seeking a stay of the order to remove the monument by midnight on AUG-20. His lawyers complained that U.S. District Judge Myron Thompson had acted improperly when he stated that the State of Alabama was responsible for the monument removal. Thompson disagreed, saying: "The chief justice argues that this act showed a disrespect for the sovereignty of the state of Alabama and its officials. To the contrary, this court did this out of a profound respect for the state of Alabama and its law-abiding public officials." The Christian Defense Coalition is organizing a 24/7 protest starting on the early morning of AUG-21. Their demonstrators will kneel around the monument and try to prevent its removal. Jay Sekulow, founder of the American Center for Law and Justice, criticized Chief Justice Moore's action in triggering a constitutional showdown. Richard Land, head of the Ethics and Religious Liberty Commission of the Southern Baptist Convention, categorized Moore's actions as "deeply disturbing." The doors of the Alabama State Judicial Building, which houses the Alabama Supreme Court, closed at 4 PM ET, an hour early. Marshals asked everyone to leave the building if they wished to avoid being taken into custody. Twenty-two people refused, were arrested and were taken to the Montgomery County Jail. One was a 17-year old juvenile who was released to his parents. Most of the rest paid a $100 bond and were released on their own recognizance. Four refused to give their social security numbers to the officers and so remained in jail overnight. They will eventually appear before a district judge. Former ambassador and presidential candidate Alan Keyes called "people of faith that really care about the restoration of America ...to come to Montgomery." He challenged conservative public officials: "If there's anyone...that continues to pay lip service to the conservative cause, you ask them first if they were in Montgomery." Vince Thacker said: "The courts make laws now. I think this is a shame. It's how we got abortion on demand. It's how we've gotten a lot of things that are against God's law." Mark Fain added, "I would say that sometimes in life you have to stand up for what's right. Those people are just like many people in the Biblical standings...when they stood up for Christianity and were willing to go the extra mile and persevere prosecution." Jay Wolf, senior pastor of First Baptist Church, told the Washington Post, "There are many people, unfortunately, who have become suspect of Justice Moore's motives." Judge Moore has refused requests to be interviewed by local media. He is reported to be making statements only to national media, including CBS, ABC, CNBC and Fox. Tom Parker read a statement from Moore which said: "The U.S. Supreme Court's denial of a stay today will not deter me from continuing to fight for the right of our state to acknowledge God as the moral foundation of our law. I still have pending a petition for writ of mandamus and prohibition in the Supreme Court. I will also petition the Supreme Court for an appeal on the merits in this case. I expect that the court will vindicate the rule of law regarding the acknowledgement of God in our state." During an interview with Fox News, Moore said: "I have no intention of resigning....The problem with politicians in office is they'll say one thing, then when they get into office they do something else." John Giles, spokesperson for the Alabama Christian Coalition said that his group has permits to remain on the sidewalk for up to three weeks and "if we need to we will." He called the the Ten Commandments the "cornerstone of Western civilized law." He is reported as saying that the the U.S. Supreme Court is in conflict with this order. 2002-AUG-21: Deadline passes: The date and time imposed by Judge Thompson of the 11th U.S. Circuit Court of Appeals for the removal of the monument has passed. The monument was still in place. The associate justices of the Alabama Supreme Court ordered a plywood-like curtain or partition to be installed around the monument. The Alabama State Judicial Building has been closed to visitors. Only those with official business are being allowed to enter. Asking for the judge's immediate resignation. Planning to file a a motion asking that Judge Moore be held in contempt of court. 2003-AUG-21: Associate Justices of the Alabama Supreme Court order monument removal: By unanimous agreement, all eight justices of the court issued an order that the monument to be removed. Senior Associate Justice Gorman Houston told WSFA-TV that all eight associate justices of the Alabama Supreme Court had agreed to issue an order countermanding the order of Judge Roy Moore concerning the Ten Commandments monument. Houston said they had notified the building supervisor to make immediate plans to remove the monument to a more private location in the building. The order stated that they were "bound by solemn oath to follow the law, whether they agree or disagree with it." Speaking before a supportive audience in front of the Judicial Building, Chief Justice Moore said, in part, "Let me assure you the fight to defend our constitutional rights to acknowledge God must and will continue....I have been ordered to do something I cannot do, violate my conscience...If the rule of law means to do everything a judge tells you to do, we would still have slavery in this country...I say enough is enough, that we must dare to defend our rights, which is the motto of this great state...I will never, never deny the God upon whom our laws and our country are based." He said that his appeals to the U.S. Supreme Court would continue and that "to do my duty I must acknowledge God. That is what this case is all about." "Today is a sad day in Alabama. Because of a series of what I believe to be erroneous federal court rulings, the Ten Commandments monument has been ordered removed from the Alabama Judicial Building. Although I fundamentally disagree with what the federal courts have ordered, the State Supreme Court was correct in unanimously voting to uphold the rule of law." "Because we are a society of laws, the Alabama Supreme Court has a duty to comply with the federal court order, whether they agree with it or not. By not complying, the state stood to incur some of the most expensive fines ever imposed on Alabama. The suggested fines could have exceeded $1 billion within just four months. With an already underfunded judicial system, as evidenced by the suspension of jury trials in the past, and the current $675 million shortfall that threatens further cuts, the associate justices took the only responsible course of action." "Attorney General Bill Pryor should be commended for showing similar resolve to ensure that the rule of law prevails in Alabama. General Pryor and I will continue to pursue every possible course of legal action to protect the First Amendment rights of all Alabamians." 2003-AUG-22: Chief Justice Moore suspended from office: The Alabama Judicial Inquiry Commission -- the state's legal ethics commission -- acted on the complaint filed by Stephen Glassroth, attorney for the Southern Poverty Law Center. The Commission referred the complaint to the Court of the Judiciary which has the authority to discipline and/or remove any state judge. The referral has the effect of suspending Judge Roy Moore from his position as the Chief Justice of the Alabama Supreme Court. "...to uphold the integrity and independence of the judiciary..."
"...to observe high standards of conduct so that the integrity and independence of the judiciary may be preserved..."
"...to avoid impropriety and the appearance of impropriety in all his activities ..."
"...to respect and comply with the law as required by Canon 2A of the Alabama Canons of Judicial Ethics..."
"...to conduct himself at all times in a manner that promotes public confidence in the integrity and impartiality of the judiciary..."
Dean Young, executive director of the fundamentalist Alabama Christian Family Association, said that the Commission review would "be making Judge Moore into a martyr." He described the investigation as "a witch hunt." Attorney Richard Cohen of the Southern Poverty Law Center said: "Nothing could be more contrary to the canon of ethics than for a Supreme Court justice to say that he was going to defy a federal court order." John Giles, head of Alabama's Christian Coalition, allegedly issued an action alert to their members asking them to saturate the Commission's phone lines with calls supporting Judge Moore. According to reports, many hundreds of calls arrived at the office. Senior Associate Justice Gorman Houston will become the acting chief justice. The court will now only have eight justices. Having an even number might seriously affect their ability to issue definitive rulings. "Breaking -- Moore says 'No Way!' to federal order, won't remove unconstitutional Commandments," AANews, 2003-AUG-13. "Moore supporters rock out, but Atheists, Freethinkers stand firm for state-church separation," AAnews, 2003-AUG-17. "What's next in the case of the 10 Commandments," WSFA.com. 2003-AUG-21, at: http://www.wsfa.com/, as originally posted. Ibid, as updated 2003-AUG-21 at 4:15 PM. "Moore suspended over Commandments monument defiance!," AANews, 2003-AUG-22.